Babies were eligible for enrollment to the ABC study if they were a singleton born between January 1987 and March 1990 to a mother self-identified as Indigenous, in the Delivery Suite Register at the Royal Darwin Hospital (RDH). RDH is the place of delivery for 98% of Indigenous mothers within the local Darwin Health Region of 120,000 km2 and also functions as the tertiary referral hospital for a sparsely populated (0.2 people /km2), vast area (2 million km2 ) of northern Australia. Between 1987 and 1990, 686 Aboriginal babies born at Royal Darwin Hospital were recruited to the ABC study. 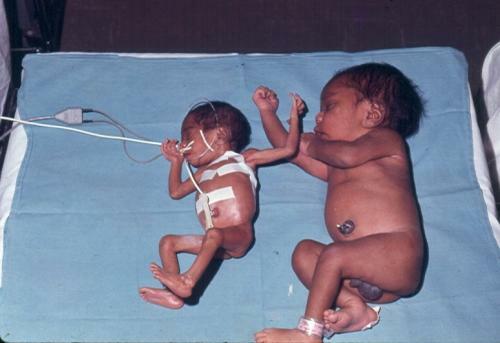 These babies were 55% of the1256 eligible babies born during this time. Those in the study and those not in the study had similar gender distribution, mean birth weights and birth weight frequencies. Therefore this cohort is a good representative sample of the Top End Aboriginal population for their age group. Paediatrician Dr Susan Sayers worked with Aleeta Dawes, Aboriginal Research Assistant, to recruit babies and their mothers to the study. Mothers were approached by an Aboriginal research assistant and invited to enroll themselves and their babies in the study. Birth characteristics including weight, length and head circumference as well as maternal, perinatal and neonatal data were collected. Accurate gestational ages were not readily available therefore postnatal clinical estimation of gestational age by the Dubowitz method was performed by Dr Sue Sayers within 4 days of birth. Only 6.5% of mothers knew their last menstrual period reliably and only 8% had an early dating ultrasound (<14 weeks). Rates of babies born low birth weight, or <2500 grams, was 13% (n=76). These rates were similar to those of Angola, Tanzania and Kenya and double that of non-Indigenous Australians at the time. 7.7% of babies were born early or preterm. Using a contemporary Australian reference, 25% of babies were small for their gestational age. A third of mothers were <20 years of age, > 50% smoked throughout pregnancy and had limited antenatal care. Risk factors for babies being born small for their gestational age were maternal smoking, undernutrition and age <20 years. Bucens IK, Reid A, Sayers SM. Risk factors for reduced lung function in Australian Aboriginal children. J Paediatr Child Health. Jul-Aug 2006;42(7-8):452-457. Jamieson, Lisa Marie, Susan M. Sayers, and Kaye Frances Roberts-Thomson. "Associations between oral health and height in an indigenous Australian birth cohort." Community dental health 30.1 (2013): 58-64. Mackerras DE, Reid A, Sayers SM, Singh GR, Bucens IK, Flynn KA. Growth and morbidity in children in the Aboriginal Birth Cohort Study: the urban-remote differential. Med J Aust. Jan 20 2003;178(2):56-60.